Over the past week, I've learned two very important lessons: 1. Always say yes to burgers on a weeknight, especially when it involves kale & guac. 2. Keep your freezer stocked at all times. Welcome to the first "This Week's Eats!" Generally, Chad and I eat the same things week after week, but lately we've been feeling a bit more ambitious so I thought I would put together a little series to capture some of our favorite meals. Of course some things are still pretty repetitive such as eggs and toast for breakfast, but whenever we make a new, healthy, and affordable meal - I'll be sure to let you know with a Friday roundup! To jump right in, I have two really easy dinner recipes that are both great weeknight options! We try to eat in and eat as healthy as possible on weekdays so that we can enjoy a treat meal on Saturdays. Because of that, we often do fall into the same ground turkey routine and eventually get sooo sick of it, which makes going out to eat that much more tempting. Luckily, I love cooking and being creative in the kitchen, so in essence this has been a pretty fun week! The first recipe taught me my first important lesson of the week: always say yes to burgers on a weeknight! Do you ever just crave a really juicy burger and heavenly soft bun? And then catch yourself drooling and realize it's only Tuesday night? Well drool and wait no more! 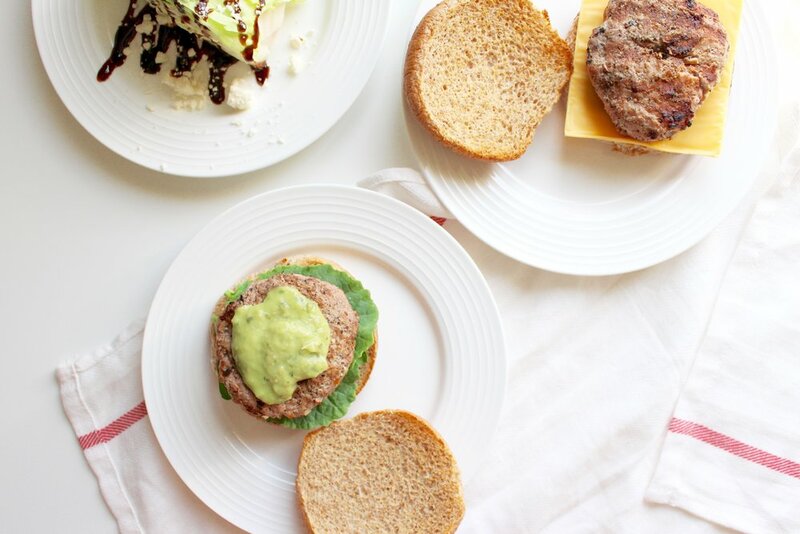 This turkey burger recipe is so minimal and when paired with a whole grain bun, it makes for the perfect healthy dinner. In a large bowl, mash up the ground turkey and being to add seasonings. Begin to form 4-8 round burgers and set aside. Grill or sear and bake burgers until cooked throughout. 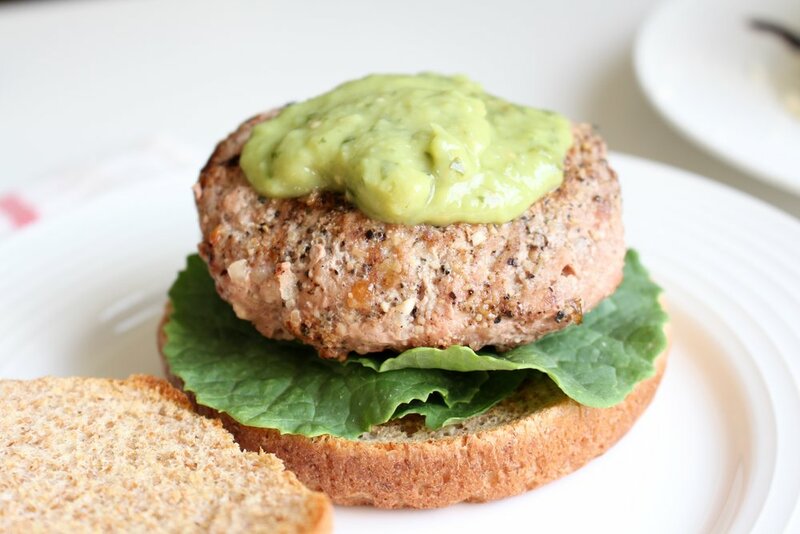 What To Add: Along side my whole grain bun, I choose to add a few layers of baby kale, and topped it with a tablespoon of tomatillo and avocado guacamole. Chad went with a classic 'cheeseburger' and topped his with a homemade bbq sauce. 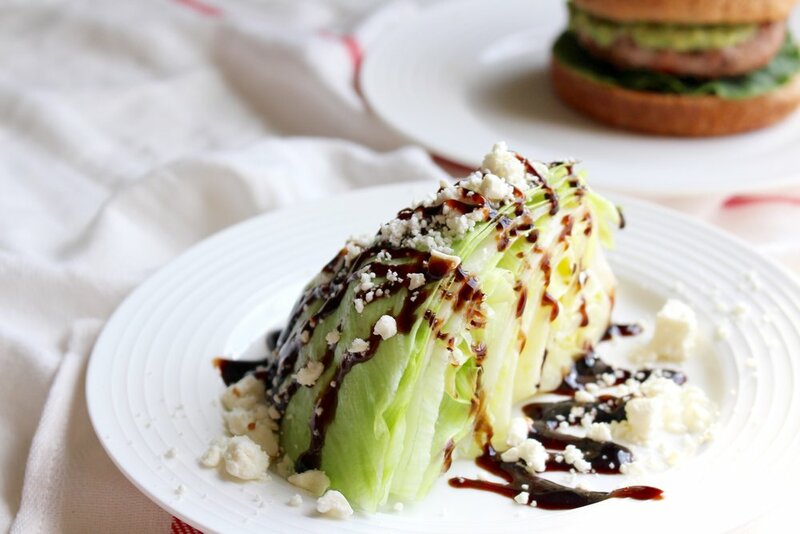 Wash and cut the head of lettuce into 4 quadrants. Place two aside and let dry. 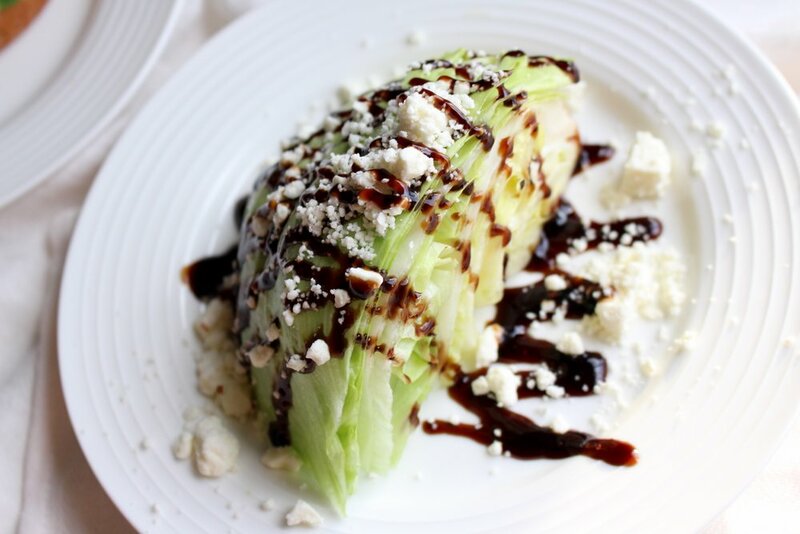 Plate and add cheese and a drizzle of balsamic glaze or dressing. The second lesson was thanks to running out of food because we spent a bit too much for the Fourth of July! However, it was a very good thing because digging through our freezer was something we have been meaning to do for some time now. Surprisingly enough, we made a pretty killer meal with ingredients that we had right at home! My advice is sincere, keep your freezer stocked! You never know when you might need to whip something up on a whim. I know going out is a much easier alternative when something like this happens, but trust me, save some money and make what you already have! We realized that we had 4 sirloin steaks in our freezer that we bought on sale a few months ago. If we would've decided to go out that night instead of checking out the freezer, we would've been missing out on this ridiculously good and healthy dinner. Generously season and rub steaks with salt, pepper, and paprika. In a large cast iron skillet, carefully sear both sides of the sirloin for 3-4 minutes. Take off and let cool once it has reached your cooking preference. In the same hot cast iron, slowly add 1/4 cup of water, 1 package of sliced mushrooms and 2 tbsp. minced garlic. Continuously stir making sure the mushrooms do not burn. 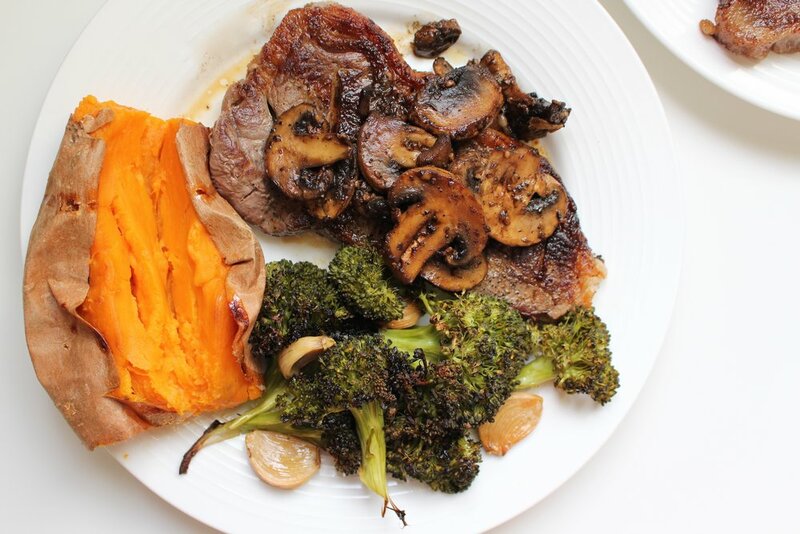 Once finished, plate and top steak with the mushroom topping. Preheat the oven to 375ºF. Scrub two large sweet potatoes, pat to dry and carefully poke holes over the entire potato. Place on a baking sheet and bake for 1 hour. Once soft, open the potatoes by cutting a 3 inch slit down the front. Let bake for another 30-45 minutes. These are both REAL meals that I eat and love! It's all about balance and enjoying the food you're eating. Don't be afraid to have a bun with your burger, because whole grains are incredibly good for you and pack a ton of fiber and protein! Don't be afraid of red meat, it's not going to bulk you up or make you fat. 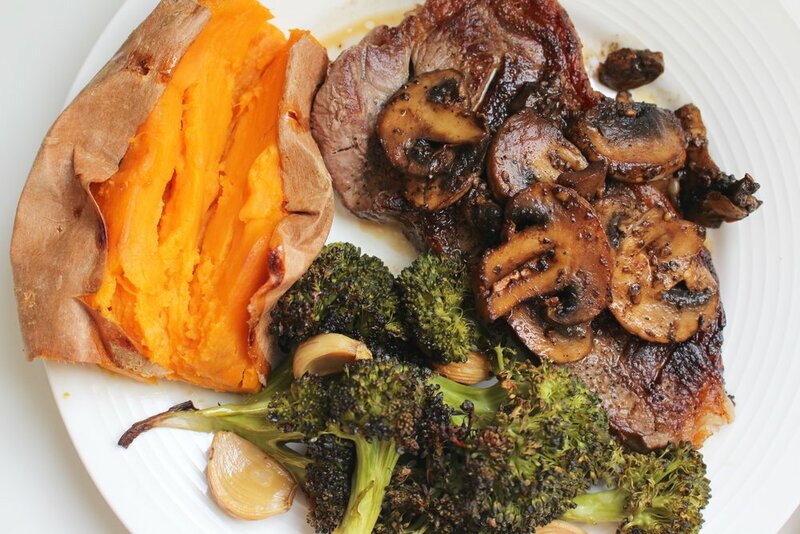 Red meat is great on occasion and filled with protein, iron, zinc, and B Vitamins! I enjoy red meat at least once a week and I have even noticed a difference in hormones and stress levels. I hope these recipes help you if you're stuck in routine or a mid-week slum. I'm just a collage gal working from a small apartment kitchen, and living to eat as healthy as possible on a budget. If I can do it, you can too! As always, I hope you love it as much as week did and if you have any questions, dot hesitate to leave a comment down below!